This fabulous traditional chestnut stuffing recipe, using fresh chestnuts (or canned, if it's easier for you), is a very delicious and rich side dish. It's perfect stuffed into a turkey for Thanksgiving, or baked in a casserole dish at 350 F for about an hour and served with roast chicken or meatloaf. You can certainly make this dish with fresh chestnuts, but you can use canned, peeled, and roasted chestnuts as well. The flavor of the canned product is close to the freshly roasted variety, with much, much less work. Chestnuts add a subtle nutty flavor to this easy recipe and a wonderful texture. Serve with some roasted asparagus or steamed green beans and whatever main dish you'd like. With a sharp knife, cut slits in the surface of the chestnuts. Place the chestnuts in a medium saucepan, cover with cold water, and bring to a boil over high heat. Then cover the saucepan, reduce the heat to medium, and simmer for 25 minutes or until the chestnuts are tender when pierced with a knife. Drain the pan and let the chestnuts cool until you can handle them. Carefully peel the chestnuts using a sharp knife. Discard the skins and chop the chestnut meat coarsely. You can substitute two cups of canned chestnuts, rinsed, and drained. In a medium saucepan over medium heat, melt the butter. Stir in the cooked and chopped chestnuts, onion, garlic, salt, pepper, marjoram, thyme, and poultry seasoning. Cook until the onions are tender, about 3 minutes. Transfer everything to a medium baking dish and mix with the cubed bread. Drizzle this over the cubed bread mixture. Toss with your hands gently to coat everything well. You're ready to stuff your bird! Use this mixture to stuff into a seasoned turkey. Roast according to the directions on roasting tables. 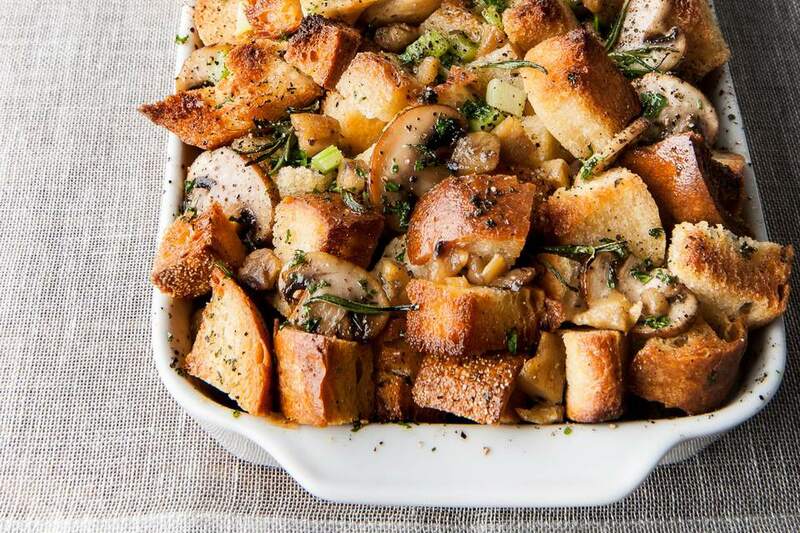 If stuffing is left over, place it in a greased casserole and bake at 350 F for 55 to 65 minutes, or until the top is crisp/lightly browned and a thermometer registers 165 F.